Burnt Hills is a hamlet within the town of Ballston, in Saratoga County, New York, United States. Its ZIP code is 12027. The hamlet derives its name from the fact that the area was burned over at the time the first settlers arrived. The records of the Burnt Hills Baptist Church extend back to 1791. The father of the notorious Tory spy in the Revolution, Joseph Bettys, was an early settler, and "Bettys Tavern" is located just north. 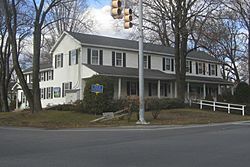 Burnt Hills, New York Facts for Kids. Kiddle Encyclopedia.